With the iPad Gooseneck Stand, you're no longer need to hold your tablets hardly. It can be mounted onto any desk, bed headboard, cupboard, etc, so you can watch TV shows or YouTube videos in bed/sofa/kitchen comfortably. Totally free your hands. ieGeek gooseneck tablet stand is an universal size that available for all 7-11 inch tablets, eg iPad 2/3/4/5, iPad Air, Samsung Tab 3, Tab 4, Tab S2, Tab S, Tab Pro, Note Pro, Google Nexus 9, etc. The gooseneck arm is super solid with long arm up to 68cm, please twist it into "S" or "C" shape for better stability（The gooseneck is very solid and you may need take some effort to do that). Now you no longer need to strain your body or your eyes, let the lazy bracelet relax you for a more comfortable & enjoyable experience during reading, movie, game playing, etc. Made in quality, durable and sturdy construction with sure-grip touch points will safely hold your iPad/tablet in position once you've set your desired mounting location. The tablet stand is solid and very easy to install with desk clamp and no drilling or tools required. Just put one corner in firstly and then pull the other corner apart, stretch to the proper size to match your tablet. 1.Please turn the gooseneck into "S" or "C" shape for better experience (The gooseneck is very solid and you may need take some effort to do that). 2.It will shake or bounce if being touched or interacted during using due to the long goosneck (100cm) and the wight of your device. If you don't like the shaking, maybe this is not your final choice. 3. Don't over-tighten the clamp screw, otherwise it may break the upper panel. ★ FLEXIBLE LONG ARM & 360° ROTATION - Tablet can be positioned exactly where you want it for viewing convenience. Strong 26.5"/68cm gooseneck can be bent and twisted into a stable "S" or "C" and the tablet clamp that holds your device is 360 degrees rotatable.And the gooseneck is very solid and you may need take some effort to twist it. 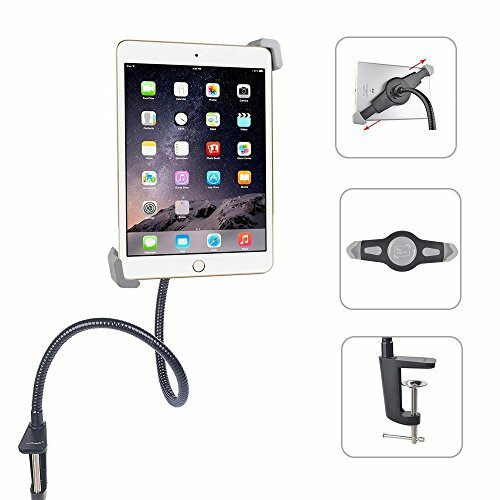 ★ ADJUSTABLE TABLET HOLDER CLAMP: EASY IN, EASY OUT - Easy to put the tablet in and take it out. Pads protect the tablet from damage and slipping out of the clamp. Please don't over-tighten the clamp screw. ★ PERFECT FOR ANY PLACES - Tablet holder can be mounted on any desk, table, bed headboard, counter top, nightstand , etc. with a thickness of 2.45"or less. Use the adjusting screw to open the sturdy c-clamp then screw it closed to secure the tablet stand. ★ WARRANTY - 30 days money back, no questions asked; 1 year hassle free replacement; 7/24 friendly customer service. Purchase 100% risk free. Kindly note that this item is suitable for viewing or reading only. It will shake quite a bit and make you uncomfortable if you need to touch or tap the device frequently. However it is inevitable due to some law of physics. If you have any questions about this product by ieGeek, contact us by completing and submitting the form below. If you are looking for a specif part number, please include it with your message.